Nick has been beavering away in the engine compartment all day. He has plumbed in the bilge pump and fitted the bracket I’d made. 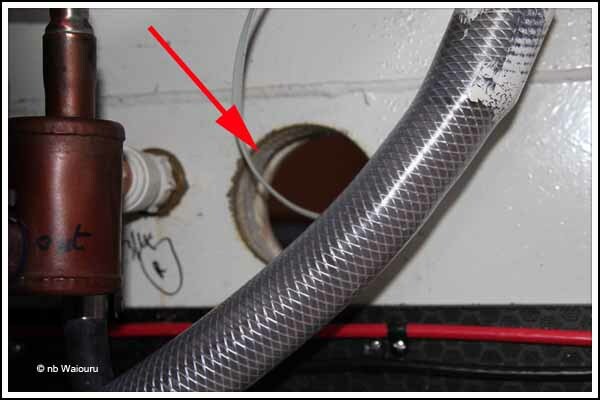 The ¾” braided plastic hose rises out of the bilge and discharges through a skin fitting on the starboard side. 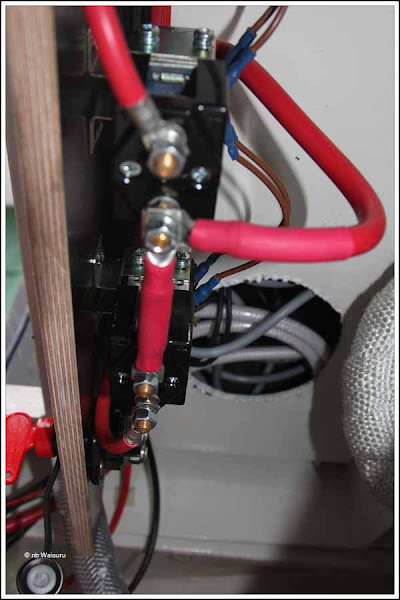 The Hexi-panel on the port side has the main battery isolation switch on it. 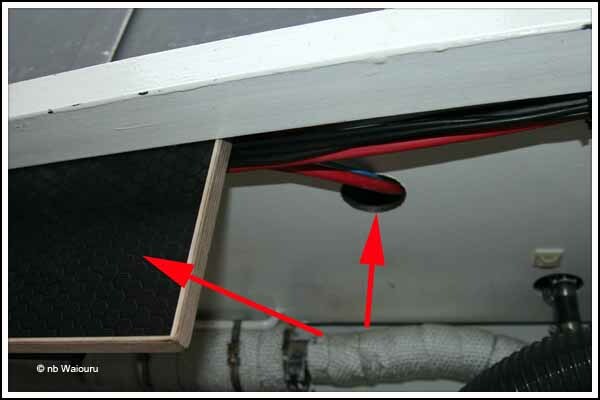 The intention is to keep this panel as free as possible using it as a shield to protect against the Hurricane heater exhaust. However Nick has mounted the Smartbank Controller and two 200A relays on the reverse. Looking up at the relays on the reverse face of the Hexi-panel. To the left of the relays is the Smartbank Controller unit as seen in the next photo. 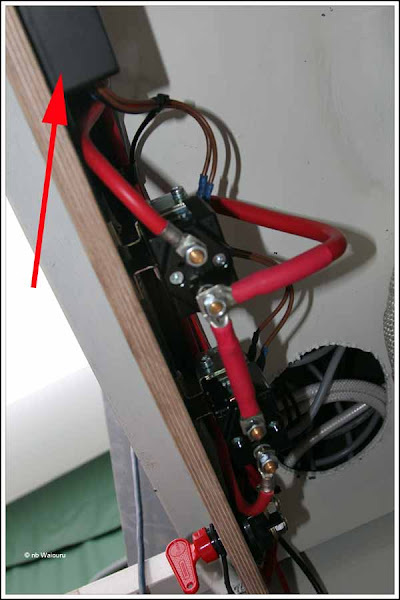 Both engine alternators are connected to the domestic battery bank. 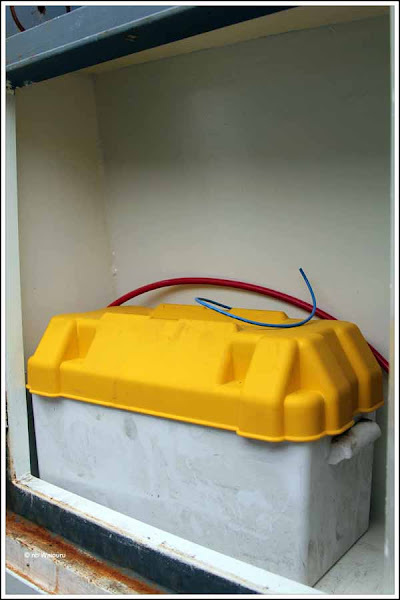 When the domestic bank reaches a certain level of charge the Smartbank Controller cuts in the first relay which starts charging the starter battery. 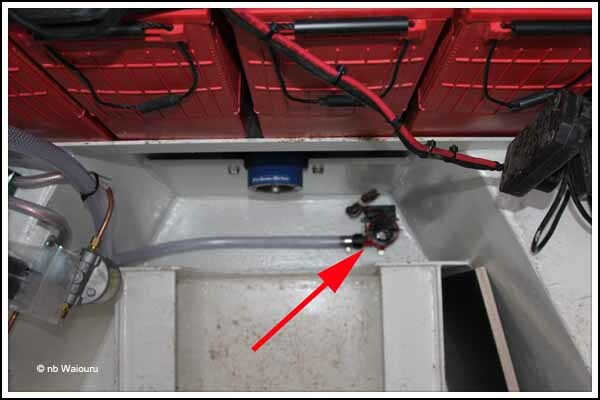 When that reaches a determined level of charge the SmartBank cuts in the second relay which connects the bow thruster batteries. The Smartbank monitors all three battery banks ensuring they get charged. Nick still hasn’t decided where to fit the Sterling PDAR. 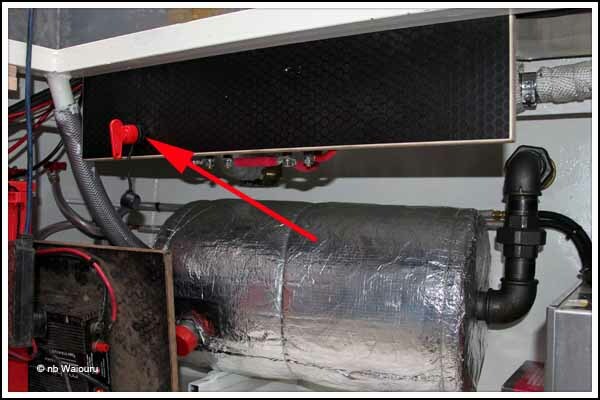 The PDAR “tricks” the 175A alternator into delivering a greater charge than normal. 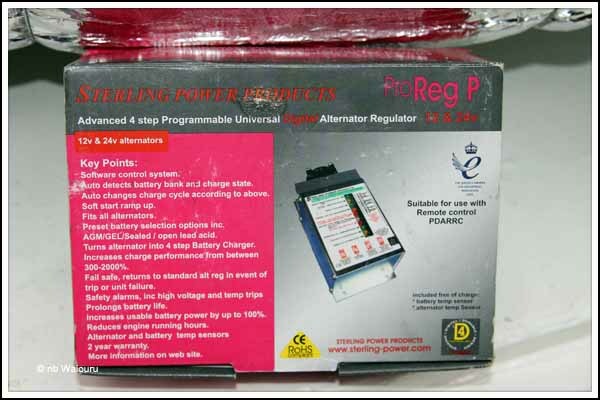 It also monitors the domestic battery bank charging regime ensuring the batteries are charged effectively and efficiently. He could mount the PDAR beside the main battery isolation switch or there is plenty of room on the engine rear bulkhead. We would probably prefer it beside the isolation switch as the hexi-panel on the rear bulkhead looks like a good “shadow board” for some tools! Around mid afternoon Nick mentioned he might have to stop work as he had run out of cable access between the engine compartment and the back cabin. My original 50mm hole is now full of cables. Rather than allow work to cease I immediately volunteered to cut the hole. Besides…. I need the practice! 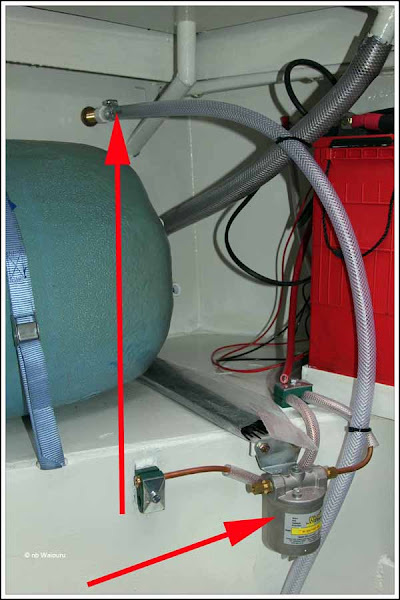 The photo is somewhat blurred as the auto-focus on the camera was fixated on the plastic hose. It’s a 3” hole for the battery to inverter cables which are rather substantial. 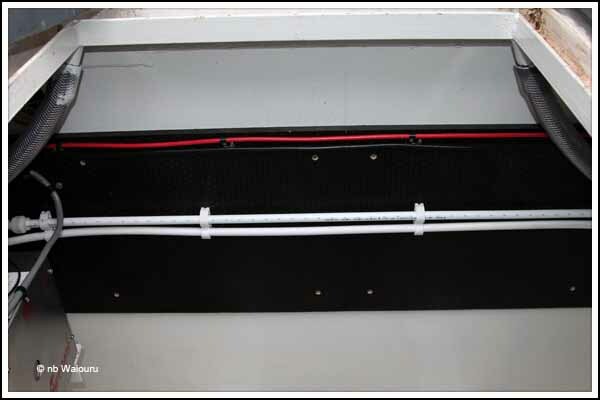 There are also a number of other electrical cables for devices such as the fuel tank gauges, bilge pump, navigation light switch, headlamp. horn, etc. My hole cutting technique has improved so Nick asked if I would cut a 2” hole in the floor of the port locker. There it is tucked in behind the isolation switch hexi-panel. He hasn’t been able to find a suitable location in the engine compartment the engine starter battery. So we are mounting it inside the port locker. Actually locating it in the locker will make access much easier. We will probably make set of shelves to go above it to maximise the locker space. Darren arrives back tomorrow which will hopefully mean the masking of the boat will be completed and we will make a start on the paint preparation.